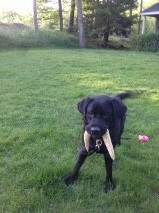 "James, our 1 year old Labrador, loves these antlers! He likes to toss them around and play with them in the yard, and he will chew on them for HOURS!" 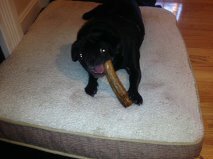 "We got a medium size moose antler chew toy for our pug, Sputnik. From the moment he received it, he has absolutely loved it. He literally carries it around the house – on the sofa, on his bed – wherever he is, the antler isn't too far behind. This is quite a feat considering his size compared to the antler he received. It has quickly replaced any other toy in the house! A must have for any pup who likes to chew!" "Great toy for Casey. Doesn't make her gums bleed like the rawhide toys, they are super durable (the rawhides were gone in a matter of hours - we are on week 2! ), and best of all, she LOVES it. She'll chew on that thing all day if we let her. We even have to take it away at night because the chewing keeps us up! No complaints at all. Great stuff."